Finally, French farmers have had enough with EU regulations, and have taken to the fields to protest the discriminatory European regulations that are due to come into effect in 2018. If we sit around and let the EU bureaucrats continue ruining perfume's historic and cultural uses and heritages, the beautiful lavender fields that are an iconic site in Provence will be no more. In addition, traditional herbalism and aromatherapy are also going to hurt as a result, if the fragrance industry's demand for lavender will tumble down. Article and image via AP. "Lavender has been used for thousands of years," said Francis Vidal, honorary president of APAL, an organization of lavender essential oil producers. "We never heard of any serious problems. Instead, we know that lavender oil helped save tens of thousands human lives." How can a plant that saved and healed thousands of lives can now be considered a "chemical hazard" and require red & black warning labels by 2018? EU regulators got their priorities backwards. And their facts. As long as they have their little bureaucratic jobs, they will keep the lives of growers, distillers, aromatherapists, manufacturers, perfumers and consumers a s difficult as possible. I'm sure it makes them feel self-importance and worthy. But this has got to stop. Southern France will not be the same without lavender, and neither will the rest of the world!!! 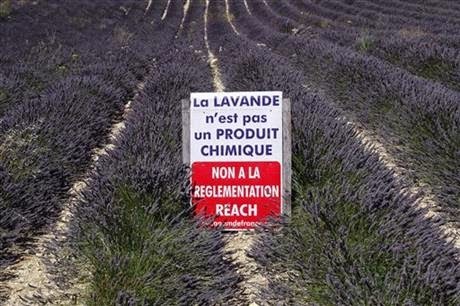 Please share widely, and support the Provencal lavender farmers!